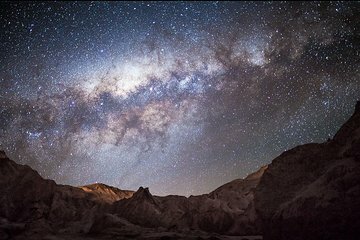 Gaze at the sparkling stars of the Atacama Desert with an expert astronomer on a 2.5-hour stargazing tour from San Pedro de Atacama. Visit South America’s largest astronomical observatory and gain insight into the secrets of the night sky; stare at stars through a state-of-the-art telescope, discovering glowering planets invisible to the naked eye; and capture photographs of the moon’s crater covered surfaces. Conclude your magical evening with a steaming cup of cocoa as you digest your newfound cosmological knowledge. Greet your guide at either the astronomy agency in downtown San Pedro de Atacama, or enjoy hotel pickup depending on which option was selected. Venture to the heart of the Atacama Desert, the driest natural expanse on the planet, to begin uncovering the mysteries of the cosmos. Arrive at South America’s largest public observatory and begin learning how to use to the technologically advanced telescopes; the clear skies and high elevation of the desert make it the ideal place to spot shimmering stars. Listen as your knowledgeable astronomer guide explains constellations of the cosmos, teaching you how to read the intriguing code of the night sky. Follow the direction of a green laser as your guide escorts your attention to stars and planets. Become acquainted with the 10 on-site telescopes then maneuver each one to capture the mind-blowing magnificence of the night sky; spot explosive nebulae in vivid colors; zoom into the rugged craters of the moon’s surface; and marvel at the scattered formations of other galaxies. Re-adjust your telescopes under the guidance of your expert astronomer, who will also answer any questions you have. Conclude your evening with a steaming cup of hot chocolate then relax during the journey to San Pedro de Atacama. Please note: this tour does not operate on full-moon nights.